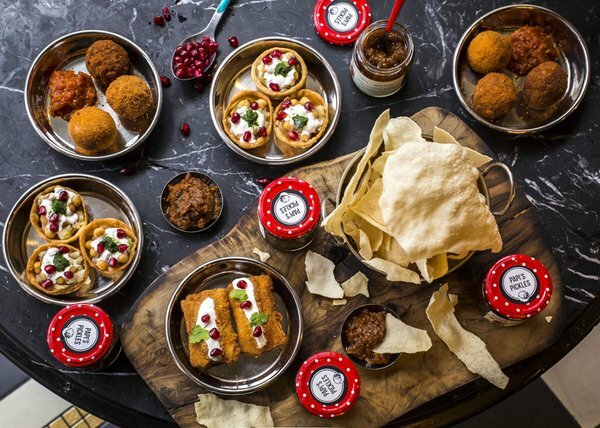 Papi's Pickles, the South Indian social enterprise which serves amazing Indian food, will be serving in the downstairs bar of Bread Street Kitchen at One New Change, St Pauls, every Friday this April. Expect a very superior (but reasonably priced) menu, including Sri Lankan Mutton Rolls, and South Indian Masala Dosa, plus desserts like doughnuts with homemade cinnamon ice cream. "Bread Street Kitchen in St Paul’s continues to champion London’s unstoppable street food scene as it welcomes Papi’s Pickles for the next edition of Bread Street Bar Sessions. The South Indian and Sri Lankan social enterprise will embark on a month long residency starting from Friday 1st of April and continuing every Friday from 6-11pm. Using the best locally sourced, organic produce to showcase the region’s stirring culinary heritage, Papi’s Pickles’ dishes out homemade feasts topped with their signature ingredient of fresh seasonal pickles, an integral component of South Indian cuisine. 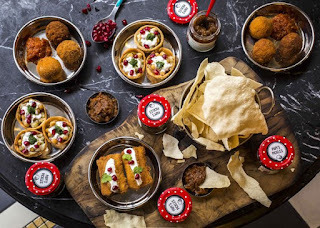 For their Bread Street Bar Session residency, Papi’s Pickles have curated a menu consisting of their most popular dishes to take diners on an exotic gastronomic journey. Start with a selection of seasonal pickles – think smoked aubergine and carrot or green apple, fig and roasted garlic – served with appalam (South Indian poppadoms). Starters include Sri Lankan mutton rolls, made with free-range lamb and potato and chickpea chaat bowls drizzled with tamarind, coriander and yoghurt sauces, with mains of South Indian masala dosa, served with an array of accompaniments including sambar, a lentil, onion and tamarind sauce, fresh coconut chutney and sundal salad. Finish your journey with gulab jamun, a South Indian doughnut soaked in a sugar syrup, flavoured with rosewater and saffron and served with homemade cinnamon ice-cream. Besides tantalising the taste buds, Papi's Pickles is a family-run, social enterprise. It acts as a platform for women from South Indian and Sri Lankan communities who now live in London to use their kitchen skills to earn an income, build confidence and play a purposeful role in society, and reinvests all profits in achieving these social aims. Bread Street Bar Sessions is a celebration of food, street culture and music, reflecting the culinary diversity of London by hosting regular pop-ups in partnership with some of the capital’s best street food vendors. Located at One New Change, Bread Street Kitchen is part of the Gordon Ramsay Group."